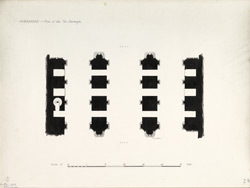 Plan of the Tin Darwaza or Triple Gateway at Ahmadabad, in Gujarat from James Burgess' 'Original Drawings [of] Muhammadan Architecture of Ahmadabad.' Tin Darwaza, located near the entrance to Ahmadabad's Jami Masjid, was constructed during the period of Sultan Ahmad Shah (r.1411-42) as the principle gateway to the Maidan Shah or Royal Square of the Palace complex. The three arches in this gateway measure approximately 24 feet in height. The central passageway spans to 17 feet, while the side passages are 13 feet in width. The piers supporting this structure are 38 feet in height and 8 feet thick.